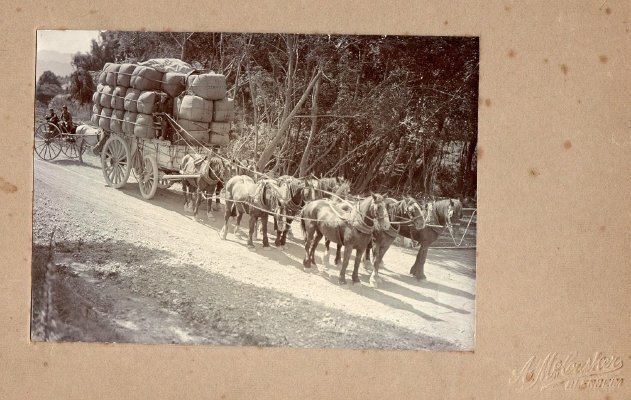 Description A black and white mounted photograph of a team of eight horses with a large load of wool bales stacked around the reinsman. A small two-wheeled horse drawn vehicle with two boys in it is behind the wagon, it is possibly the photographer's gig. Written on the back in Allen Hale's handwriting: "Hillersden wool waggon (bringing wool to Blenheim before the station was subdivided and sold)." Stamped with A.M. Hale Collection. A white sticky label says: "Photo 8 HS". The wool wagon, a common sight. The driver is handling eight draught horses - no mean feat. He appears almost obscured by the massive load of at least 41 bales from Hillersden Station, destined for one of Blenheim's wool stores. From here, the wool will be most likely shipped overseas to Britain, either from Picton or the Port of Blenheim. Photograph taken around 1900.